The Kerala Public Service Commission has announced the date and time of the Public Relations Officer (PRO) exam for Apex societies of co-operative sector in the state. 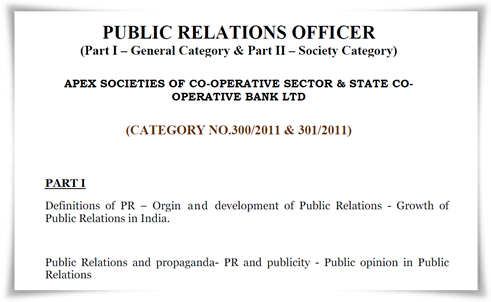 The Public Relations Officer (PRO) exam 2014 for general and society category (300/2011 – 301/2011) will be held on 2nd July (Wednesday) 2014 from 7.30 AM to 9.15 AM. According to the information from PSC, 560 candidates have applied for post. As the number of vacancies is limited, the best would get to the top spot. Candidates those who had applied for the exam can download the admission tickets through their one time registration profile in the website www.keralapsc.gov.in from 11th June 2014. The preliminarily test consists of an objective type exam (OMR Valuation) based on the qualification prescribed for the post. The duration of the exam will be 1 hour 15 minutes with maximum marks 100. Divided into 2 parts, the main topics for the exam are Part I Public Relations and Part II General Knowledge, Current Affairs & Renaissance in Kerala. With less than a month left for the exam, a methodical study is needed to score high marks. Being a core subject in the syllabus, various concepts related to Public Relations will be covered under this topic. Candidates must give prime importance in learning the various terms and historical facts regarding the topic. Definitions of PR – Origin and development of Public Relations – Growth of Public Relations in India. campaigns – Evaluation of feedback. PR and social responsibility – PR codes of ethics – professional rganizations. Candidates should have a clear picture about the historical facts about the country along with its economic and physical features. Planning-Etc. – History of India- Period from 1857 to 1947- National Movement- Etc. Topics covered in this area are:-Important World, National and Regional Events related to the Political and Scientific fields, Sports, Cinema and Literature etc. Candidates should have well knowledge about the various renaissance leaders along with important events which shaped the history of Kerala. How to prepare for Kerala PSC Public Relations Officer (PRO) exam? Just knowing the syllabus would not make up your dream to succeed in the Kerala PSC exam. Mastery over the subject along with burning desire to execute well is needed at this point. Candidates must try to give prime importance in answering easy questions first. As much practice is needed to answer all the questions in stipulated time, students should invest time to take as many Mock Tests as possible prior to the exam.